Predator Helios 300 is an overclockable1 NVIDIA GeForce GTX 1060 or 1050Ti GPU combined with a 7th Gen Intel Core i7 (7700HQ) or i5 processor (7300HQ) for outstanding performance with up to 16GB of DDR4 memory (upgradable to 32GB), a speedy SATA SSD1 and a 1TB HDD1. The Predator Helios 300 also includes a USB 3.1 Type-C port, a USB 3.0 port (featuring power-off USB charging), two USB 2.0 ports, and an HDMI 2.0 connection. It connects wirelessly through fast 2x2 802.11ac technology and also includes a Gigabit Ethernet port for those preferring a hard-wired connection. For smooth game play, a dual fan system featuring an AeroBlade 3D Fan2 with ultra-thin metal blades keeps the notebook running at optimal temperatures. The preloaded PredatorSense software provides real-time system information and overclocking, so gamers can monitor and control the system’s vitals from one central interface. The Predator Helios 300 gaming notebooks with a 15.6-inch display will be available in North America in July starting at $1,299; in EMEA in August starting at €1,199, and in China in June starting at ¥9,999. 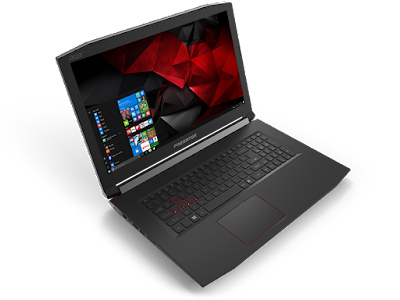 Predator Helios 300 gaming notebooks with a 17.3-inch display will be available in North America in July starting at $1,399; in EMEA in August starting at €1,199, and in China in July starting at ¥9,999.